Christian had the best day of anybody at camp, taking home the MVP. He had multiple 30-point game in the 5v5 and was the 1v1 champion. He no doubt had the play of the day to when he hit a contested three to win his first game. Christian’s guard skills were on display all day. He took it to the hoop at will all day and was able to finish through contact. He was consistent all day from downtown which made him extremely hard to guard for his opponents. Physically he was head and shoulders above almost all the other kids in the gym. With his guard skills he will likely be able to step in right away next year at Parke Heritage and have an impact. Russ was able to dominate the floor all day long. He’s built like a tank and was able to use his size to score nonstop down low. 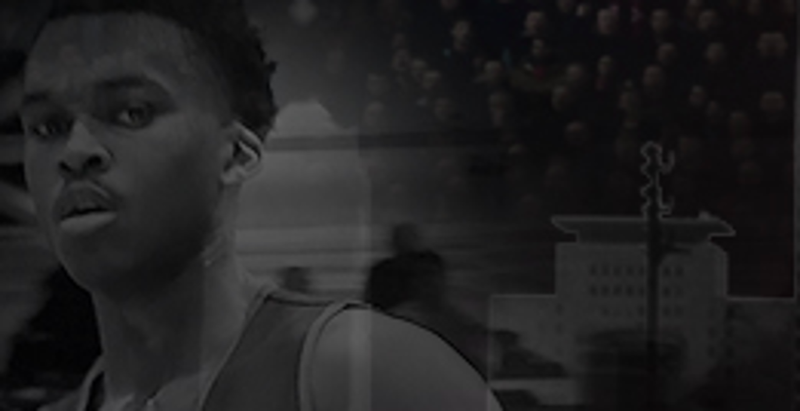 What impressed me most about Russ was his ability to play with his back to the basket. He has a very solid jumper that will continue to improve with time. I like his potential going forward and he will be to develop under an extremely good Warsaw coaching staff. Hooks came out and showed everyone why he was nationally ranked. He is a freak athlete who could be seen from all corners of the gym throwing it down. His ability to get to the rim and finish was phenomenal. When a player with Hooks size has athleticism and skill there is few who can stop him. Hooks has the potential to come into Warren Central next year and help the team right away. The nationally ranked Ware was a force all day long. He used his size and athleticism extremely well which helped him dominate on the drive. His ability to create his own shot was impressive, along with his shooting touch. He really came out and proved why he is so highly regarded. The future Warren Central player has a great shot to help the team immediately next season. This was our first viewing of Brown, and his length and skill were impressive. He was crisp during the station work, not taking any repetitions off, and he competed during the games. He played a little fast at times, but young kids struggle with a sense of pace, especially when trying to get through traffic. As his jump shot improves, he could cement himself as one of the top wings in the class. Dhani was dominant in a camp mostly filled with 8th graders. He came out and showed he was legit scoring in many different ways. His outside shot is extremely good for his age. Some kids just have an ability to score the basketball and Dhani is one of those kids. I think he has a very high ceiling and will develop into an elite player as he gets older. Damon was outstanding, at 4ft 8 he was able to dominate just as much as kids that are over a foot taller than him. He is extremely quick and can score it on all three levels. His ability to finish in traffic at 4ft 8 was unbelievable, he might have been the hardest working guy at camp. Which is really what stood out along with the fact he was able to find teammates and facilitate. Van was a force down low throughout the day. He was fearless on the glass pulling down many rebounds and making some great outlet passes to teammates. His footwork was good and he could put the ball on the floor pretty good as well. He will likely become a very solid guard down the road. All the tools are there; he just has to put them to work. For a 6th grader Jerry has ridiculous upside. He is a really good athlete who has great feel for the game. His guard skills were on display throughout the day. His handles were extremely mature for his age. I really like his shooting touch and he was able to hit jumpers with consistency throughout the day. Jerry found teammates and was able to control the game. He has a very high ceiling and has the ability to take himself really far. Demetrius was able to standout throughout the day because of his size. He was able to keep control finishing through contact and got to the rim with ease. His length helped him on the defensive end and boards. As he starts to develop his guard skills he will start to unlock more of his potential. I really like what Demetrius has to offer going forward. Dietrich showcased his court vision throughout the camp and showed out with his ball handling. He had a good touch around the rim along with a good looking jump shot. Despite being shorter than most of the kids out their Dietrich found a way to show out. If he can keep working on his skills he has the ability to become a solid player. Howard was a factor all day long at camp. He found ways to get to the hoop and finish with ease. His ability to score was unmatched compared to his competition. For a 5th grader his court vision and IQ were way above where they should be, along with his shooting touch. His ceiling will be very high as he continues to grow as a prospect. Johnson’s ability to score was on display throughout the day. He has a great build to go along with solid ball skills. Throughout the day he was the biggest impact player on his team and he was able to lead them to several victories. His ability to create his own shot really stood out, he found ways to score with heavy defensive presence. Long term he has the potential to be extremely good if he keeps working on his craft. Amir’s defensive ability really stood out along with his rebounding. His work on the defensive end helped him get steals and he was able to finish well on the break. As far as work ethic and hustle goes few kids at the camp were working as hard as Amir. He showed his court vision by finding open teammates with several solid passes. Devin was the best player on the floor as a 4th grader in the game I watched. His ability to drive and finish are unreal for a 4th grader. Along with his good hands on defense, his court vision was outstanding. He made several passes to teammates near the basket from 40ft out. The most surprising part about his game is his floater. Most high school kids don’t have much floater game at all and Devin was making them consistently throughout the day. Devin is one of those kids who we will likely see play a big stage at some point in his basketball career. Zahden really stood out amongst the other kids due to his offensive ability. He hit several difficult step backs that were exceptional for his age. I really like his ability to score his touch was phenomenal and really caught my eye. Zahden has solid ball skills and court vision, he was able to find teammates for shots as well as do a great job creating his own shot. He has the potential to become a huge problem for his opponents. Lea Shawn is another kid who really stood out because of his hustle and defense. He made plays on both ends of the floor and played with passion throughout the day, Lea Shawn has a good feel for the game and was able to really help his team because of his ability to guard on the ball. His passion while playing is something that you can’t teach and it’s going to help him improve down the road. Brenden stood out because of his high IQ and passing ability. He played extremely hard throughout the day and played good defense. His shooting touch was solid along with his ball skills. I think as he gets older his good IQ will really help him develop into a very solid basketball player one day. Hoodies, Short Sleeve Dry-Fit Hoodies,Shorts, T-shirts, Socks and Etc. Bringing High School and Summer AAU Basketball Video Coverage to you! The InTheGymHoops team, founded in 2014 by Felix Rogers @InTheGymHoops, is all about bringing complete video coverage of anything High School sports, primarily Basketball, featuring athletes nation-wide but with a focus on Indiana talent. We take pride in providing complete coverage of any kind of Basketball event. The InTheGymHoops Team is all about helping the kids, get as much exposure as humanly possible, in the form of video. We’re here to help kids get exposure that are trying to play at the next level, whether thats D1, D2, D3, NAIA, or professional. Put your son or daughter on the map with In the gym hoops. Goto inthegymhoops.com/mixtapepricing and book our services. Also, subscribe and follow inthegymhoops_ on youtube, twitter, and instagram for highlights of all the top players in Indiana. If you or an athlete you know are interested in being featured in our InTheGymHoops video gallery, visit our contact us page. ORDER YOUR VIDEO PACKAGE HERE! Jeremiah Francis Is A STRAIGHT DAAAWG!! HAD EM TALKING AT ADIDAS GAUNTLET FINALE!!!! Guarantee to meet your expectations. No questions asked. Years of experience and network of nation wide-viewers. All of our videos get sent to several YouTube subscribers and over 12,200 + Twitter followers. Everyday we are in contact with major universities and media outlets. We can help put you on the map!